This document is intended to provide general guidelines for understanding which NoMachine products and licenses are necessary to provide highly available remote access to virtual desktops and single applications distributed among multiple Linux host. The remote computer can be your own physical or virtual machine either on-premises or hosted in a cloud. A NoMachine virtual desktop is an individual instance of the remote desktop. Instead of running a virtual instance of the whole remote desktop, it's also possible to execute single applications. These functionalities are available only with NoMachine servers on Linux in the 'NoMachine Terminal Server' family. To set up a multi-host environment made of NoMachine Terminal Server Nodes (TSN) it's necessary to have NoMachine Enterprise Terminal Server. With Enterprise Terminal Server it's possible to automatically load-balance virtual desktops among such remote TSN hosts using a number of formulas: plain round-robin, weighted round-robin and custom algorithms or based on load average. It's also possible to let users choose the Terminal Server Node manually. In this document we will see what is necessary to set-up a NoMachine Enterprise Terminal Server infrastructure and maintain high-availability of virtual desktops by means of a second Enterprise Terminal Server, associated to the first one in an active/passive failover cluster. If the active Enterprise Terminal Server fails, this second Enterprise Terminal Server takes its place to grant business continuity. This solution is suitable for medium/large business. 1 NoMachine Enterprise Terminal Server on Linux host (1 machine called "A"). 1 NoMachine Enterprise Terminal Server on Linux host (1 machine called "B"). 1 NoMachine Terminal Server Node on Linux host (1 machine called "C"). 1 NoMachine Terminal Server Node on Linux host (1 machine called "D"). The NoMachine failover cluster is established between machine A and B. The active NoMachine server will provide access to the virtual desktops distributed between machine C and D.
You need 2 Enterprise Terminal Servers to make a cluster: one server is the primary server, active and able to manage connections and dispatch user sessions among the Terminal Server Node hosts. 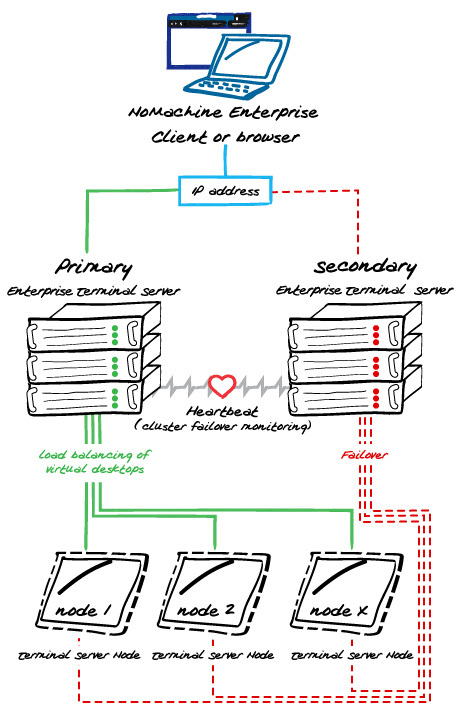 The other server is the secondary server, passive and not operative. The secondary server becomes operative only when the primary server goes down, thus taking its place. A valid NoMachine license is necessary on both servers, since the secondary server is not shut down but ready to replace the primary server in the case of failover. 1 NoMachine Enterprise Terminal Server on Linux host (1 machine called "E"). 1+ NoMachine Terminal Server Node on Linux host (1 machine called "F"). The NoMachine Enterprise Server will load-balance virtual desktops between its host (machine E) and machine F. It's also possible to let user choose if creating the virtual desktop on machine E or F.
All NoMachine hosts can be either a physical computer or a virtual machine. Multiple NoMachine Enterprise Terminal Servers, even in different geographical locations, can be federated under a Cloud Server, which provides a single point of access to different subsystems. 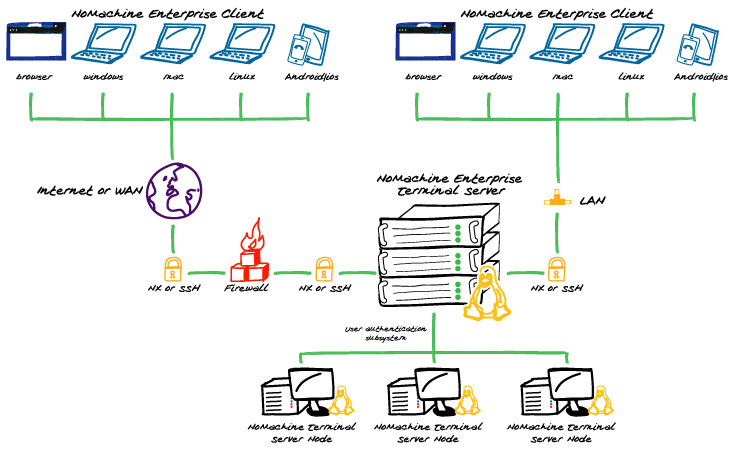 This diagram shows a multi-node (Terminal Server Nodes) environment with a single point of access, NoMachine Enterprise Terminal Server. Users can create their own virtual desktop, or run single Linux applications on any of the Terminal Server Nodes. The Enterprise Terminal Server can select the node automatically to load-balance sessions or let the user decide.